A few years back, our client had the front porch restored and now it was time to restore the rear porch, which had become unsafe and an eyesore. 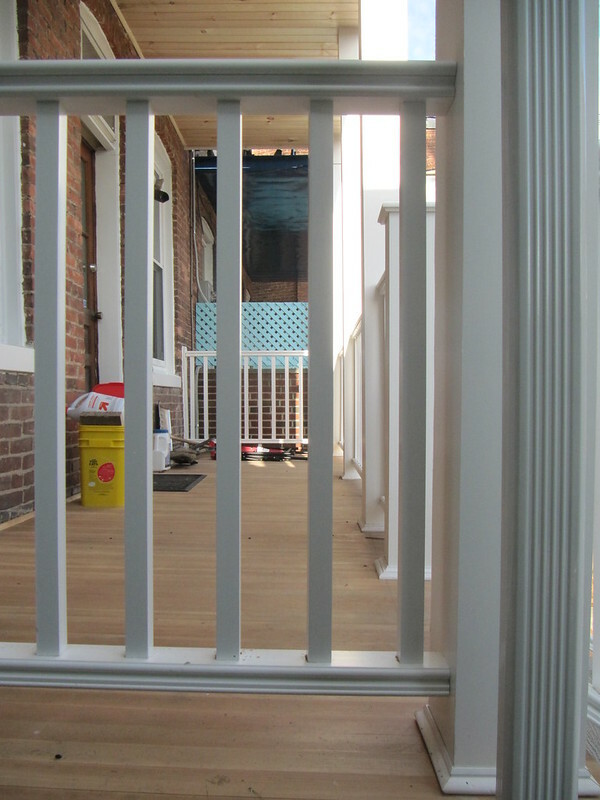 The large, two story porch in Charles Village had a lot of potential, but there were a few minor challenges to the job. The first challenge was an areaway to the basement which was constructed of wood and was detriorated. The second challenge was more of a design issue in that the orginal step location through the symetry of the new porch columns off. Not to mention there was a tripping hazard at the bottom step in the form of a drainage gutter in the concrete. There was substantial rot uncovered during the restoration, so most of the second floor framing was replaced or sistered. The wood areaway to the basement was replaced with a new steel Bilco door, which added a higher level of security with little or no maintenance. The ceilings were replaced with new beaded tongue and groove. The floors were replaced with vertical grain douglas fir. All new railings and columns were installed and included new Veratex Column Wraps, and Intex RS40350 Hampton Railings. New lighting was installed and a new roof hatch was installed in the upper roof for access to the upper flat roof. Finally, new screening was installed on the second floor so the porch could be enjoyed with the worry of insects and mosquitos.